When China joined the WTO, there were two key policy changes that helped boost its exports to the US. First, China reduced tariffs on all of the goods it imports from the rest of the world; and second, China no longer faced the uncertainty of being hit with very high tariffs on its exports to the US, as it was granted permanent normal trade relations status.1 China’s spectacular export growth post-2001, shown in Figure 1, has many implications for the rest of the world, with some of the negative employment and wage effects studied by Autor et al. (2013) and Pierce and Schott (2016). In a new study, we show that China’s global rise also generates gains to consumers in the US (the focus of our analysis) (Amiti et al. 2017). 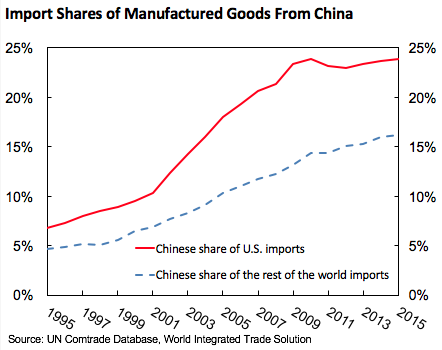 The most important channel is through China lowering its own import tariffs. China reduced its tariffs in almost all categories as part of its WTO commitments. These lower tariffs on intermediate inputs reduced Chinese firms’ cost of production because of access to cheaper intermediate inputs and because more varieties of inputs boosted their total factor productivity. With a fall in production costs, Chinese firms charged lower prices on goods exported to the US and increased their market shares in the US. A large part of the market-share gains was due to new varieties of goods exported by new Chinese firms entering the US export market. 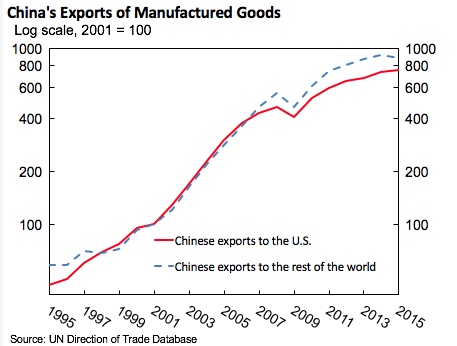 In fact, the number of Chinese firms exporting to the US more than tripled between 2000 and 2006. 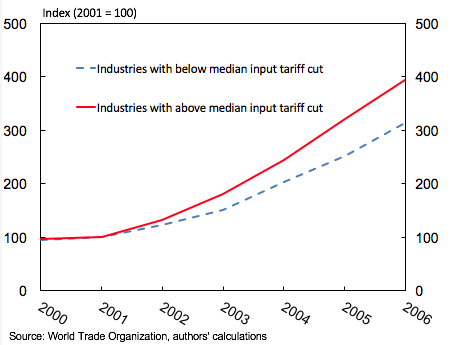 We can see the link between lower input tariffs and stronger export growth in Figure 2, where we aggregate Chinese firm-level exports to the US into two groups: the group of industries that experienced large tariff cuts on imported inputs (average tariff cuts above median, equal to 4.6 percentage points, or 43%), and the other group comprising the industries that experienced input tariff cuts below the median, with both indexed to 100 in 2001. From the graph, one can clearly see that Chinese exports to the US grew much more rapidly in industries that experienced the largest drops in input tariffs. US consumers gained from China’s WTO entry through lower prices on varieties of manufactured goods that Chinese firms were already exporting in 2000 and continued to export in 2006; and through access to new varieties. We take account of both these components in constructing US manufacturing price indices for each industry. Our results show that the aggregate US manufacturing price index fell by 7.6% between 2000 and 2006 due to China’s WTO entry. Decomposing this total effect into a price and variety component, we find that two-thirds of the aggregate effect comes from lower prices. All of this price effect is due to China lowering its own input tariffs, which results in lower prices of Chinese goods exported to the US and also lower prices of competitor firms in the US, both foreign and domestic. These lower competitor prices arise due to US firms accessing cheaper intermediate inputs from China, which lowers their own marginal costs; lower markups of competitor firms due to competition from China; and due to exit of the more inefficient firms that were unable to compete with China. The variety component accounts for the other third of the aggregate effect. The increase in the number of firms and varieties exported to the US from China is due to both the lower input tariffs and China’s permanent normal trade relations status. Removing the uncertainty of tariff hikes encouraged Chinese firms to invest in paying the fixed costs associated with entering the export market. China’s WTO entry has generated significant gains for US consumers. Our research shows that the average prices paid for manufacturing goods by US consumers were 7.6% lower between 2000 and 2006 (around 1% a year) due to China’s WTO entry. Most of these gains come from China lowering their own import tariffs, which raised Chinese firms’ productivity, exports, and varieties. Authors’ note: The views expressed in this column are those of the authors and do not necessarily reflect the position of the Federal Reserve Bank of New York or the Federal Reserve System. Any errors or omissions are the responsibility of the authors. Amiti, M, M Dai, R C Feenstra and J Romalis (2017), “How Did China’s WTO Entry Benefit U.S. Consumers?”, CEPR Discussion Paper No. 12076. Autor, D H, D Dorn, and G H Hanson (2013), “The China Syndrome: Local Labor Market Effects of Import Competition in the United States,” American Economic Review 103(6): 2121-68. The US had applied low tariffs on Chinese imports since 1980, but every year US Congress would meet to decide whether to revert to much higher tariff rates that had been assigned to some non-market economies, which averaged 24%.